I hope you'll like my stories. They're for all the tourist folks, about the Loch Ness Monster... it could be just a hoax...' Every year millions of people visit Loch Ness hoping to catch a glimpse of Nessius Neversauras, the Loch Ness Monster. 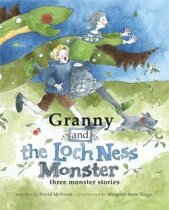 When you've read these stories, then you'll know the reason why you'll probably never see the Loch Ness Monster!